The future is looking bright for freelance writer Jaine Austen. She's signed up for a new job, she's looking forward to a tropical vacation, and her cat Prozac is slated to star in a major commercial. But when the claws come out behind the scenes, Jaine worries that murder might be the only thing to meow about. . .
A writer's life is far from glamorous. Still, Jaine's new gig to write an ad campaign for Toiletmasters' new line of self-flushing toilets comes with a few perks--including a date with the president's dreamy nephew. And with a much-needed trip to Maui on the horizon, it seems life couldn't get any better--until her cat Prozac is tapped to star in a Skinny Kitty commercial. But Jaine never would have guessed the world of cat food could be quite so catty. . .
Jaine is nervous that Prozac won't be able to take direction, but the finicky furball ditches her diva behavior for the camera, eating and napping on cue like a seasoned pro. But just as Jaine begins dreaming of fame and fortune, Skinny Kitty's inventor drops dead on the set. Everyone is a suspect--including Jaine. And she'll have to get her paws on the truth before the killer takes a swipe at another victim. . . 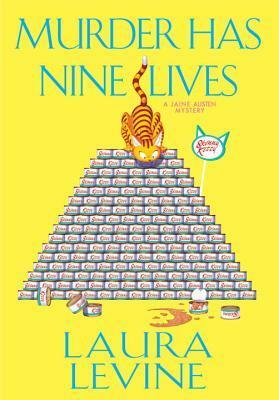 MURDER HAS NINE LIVES is Book 14 in Laura Levine's Jaine Austen Mystery series. Jaine is a freelance author living on the edge of Beverly Hills with her cat, Prozac, and her neighbor, Lance. A chance meeting with an animal agent at the vet's office leads Jaine and Prozac to the filming of a Skinny Cat commercial. Fans of the series know that Prozac plays by her own rules ... and things go awry with the filming ... ending with the death of the Skinny cat's creator. Jaine dons her favorite "Count Chocula" t-shirt and grabs the fake USDA badge she bought at a yard sale to investigate the murder and clear her name. Levine is no stranger to humor. She is the creator of Count Chocula and Frankenberry cereals for General Mills. She also wrote for The Bob Newhart Show, Three's Company, and Laverne & Shirley. Likewise, Jaine is no stranger to chocolate ... or cinnamon raisin bagels ... or Burger King drive thru. Her diet is a who's who among junk food. Jaine's life is equally chaotic with her constant search for a new writing gig to pay the rent, navigating the LA dating scene, and wrangling Prozac for her cashmere sweater. MURDER HAS NINE LIVES is pure escapism into a familiar world where laughs abound with Jaine's expanding waistline. Likewise, Prozac's expanded role demonstrates she is more than a diva - she has feelings ala Blanche DuBois from A STREET CAR NAMED DESIRE when she realizes she is the "before" cat in the Skinny Cat commercial. Jaine goes to extreme measures, including a Reiki healer, to bring Prozac out of her funk. I applaud Levine for poking fun at pop culture - it adds another layer of humor into the lighthearted plot. Levine also includes the email exchange between Jaine and her parents, retired in Florida, but reeking havoc just the same. MURDER HAS NINE LIVES is a refreshing break from reality, akin to meeting a friend for coffee for a respite from our hectic lives. MURDER HAS NINE LIVES can be read as a stand alone novel since Levine provides enough background information about Jaine, Prozac, and Lance. Recommended read for fans of cozy mysteries, diva cats, and anything chocolate. I checked out a copy of MURDER HAS NINE LIVES from my local library. - Salt N Pepa's "Push It" (link) - I love the song and the man mowing the lawn. - Playing Marco Polo in a pool (link) - I love the llama. - Kids selling lemonade with Ice T (link) - Ice T is an Army vet. 2. Due to shipping costs, this giveaway is open to US resident. But I welcome any comments from our international readers. 3. Comments are open through Sunday, November 27, 2016, 10 pm in Baltimore. Some commercials are annoying or just plain dumb. Luckily, there are so many good ones. The Hallmark and Budweiser commercials are almost always excellent. I like the Subaru ads, especially the ones with the dogs. There are several featuring returning or departing military personnel that are very nice. I love the Hallmark commrcials, the Marco Polo commercials and you have to love Flo in the Progressive Insurance commercials.There ate a lot that are actually annoying. I think I've enjoyed all of Geico's commericals. Also for Amazon Prime - the one with the little horse, gets me every time. Some are very funny - tho frequently I forget them as soon as they are over. I don't watch TV much anymore because of commercials. I just don't like them. I might tune in during the Super Bowl but other than that, I don't watch. I do have some fav commercials but since I record a lot of shows I fast forward through them. I love the Folgers coming home and Budweiser Christmas commercials. When commercials come on, I either mute the TV or change the channel.